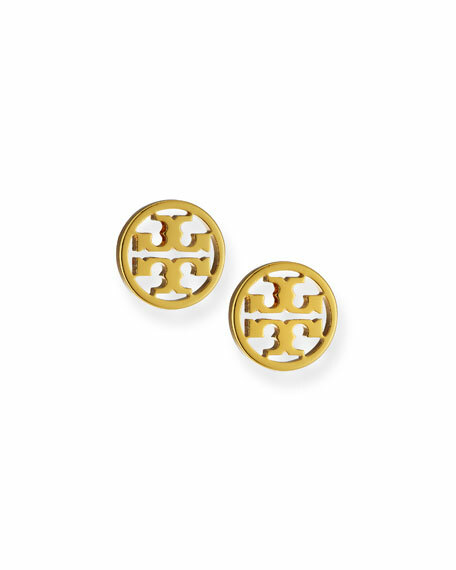 Logo circle stud earrings by Tory Burch. Polished golden plating over brass. Armenta stud earrings from the Old World Collection. 18-karat yellow gold and blackened sterling silver. Champagne diamond pav?? disc with crivelli. 0.26 total diamond carat weight. Approx. 0.4" diameter (10mm). Post backs for pierced ears. Made in USA. Fantasia by DeSerio stud earrings. 14-karat solid yellow gold frames. Round-cut prong-set cubic zirconia; 5 total carat weight. Post back. Fantasia by DeSerio stud earrings. 14-karat solid yellow gold frames. Round-cut prong-set cubic zirconia; 5 total carat weight. Post back. Made in USA. Ippolita crafts these earrings of effulgent yellow gold and radiant white diamonds for contemporary elegance. 18-karat solid yellow gold. White pave diamonds. 0.57 total diamond carat weight. Approx. 1/3" diameter. Imported.